We carry the entire Brunswick Authentic pool tables range, which is available exclusively through Home Leisure Direct in the UK. Brunswick have a long history of making high grade billiards tables in America and are still known for their luxury pool tables and games room products. These beautiful products are hand-made in the USA by skilled craftsmen, using techniques handed down through artisans since 1845. They are also made from the best materials to produce pool tables that are a true investment and that you can be proud to have in your home. 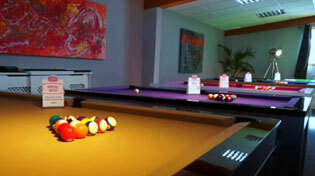 Brunswick’s range of pool tables are highly sought after and are now exclusive to Home Leisure Direct in the UK. The Brunswick Authentic pool tables range combines heritage and craftsmanship to make stunning tables. They are made from solid wood, to last for generations, and are constructed using dovetail cross supports, an age old method that will withstand heavy use and gives a modern-day standard of performance.This sturdy base is married with top quality sectional slate and SuperSpeed cushion rubber for fantastic ball response and continuos game play. The tables are then finished with genuine mother-of-pearl rail sights and genuine leather pockets, providing you with a table of pure luxury and one that will age gracefully over time. These features vary depending on what model you select, but with such a wide variety of traditional and contemporary designs available, we are sure you will be able to find the perfect Brunswick pool table for you and your games or leisure room. All of the Brunswick pool tables come with a free Contender accessory pack and a Contender cloth, but if you are serious about your Brunswick Authentic table, you will want to upgrade to the Centennial cloth and Centennial pack, which contains everything you need to get started with your new table. The Centennial range of cloth and accessories are the highest grade products that Brunswick offer and are made to match the exquisite quality of your Brunswick Authentic table. These tables also come with an impressive lifetime warranty, to give you the security and piece of mind that your table really will last a lifetime. Every table Brunswick build is backed by a lifetime warranty, a testament to the exceptional design and workmanship the Brunswick name represents. This also helps us provide the best resale value in the industry. So whether you own your table for a season or a lifetime, you'll never regret buying a Brunswick. Visit our Brunswick Lifetime Warranty page for more information. We are extremely proud to be represent Brunswick, they been building the world's best billiard tables since 1845. So when you invest in a Brunswick, you not only own the most beautiful, best-playing pool table in the world, you also become a part of this legendary heritage.